My family sure is loving all the fresh summer veggies we pick up each week from Lester Farms in our CSA basket. The produce is high quality and so fresh and flavorful. I have also enjoyed creating recipes for the CSA baskets. 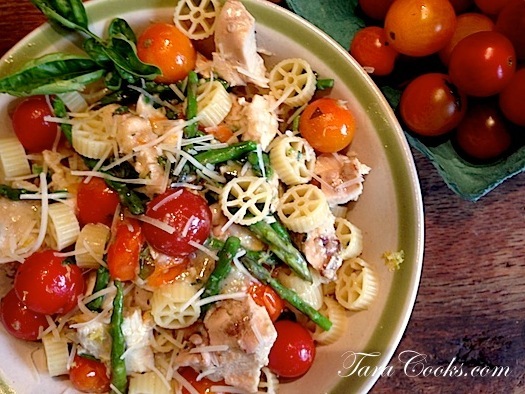 Today for lunch we feasted on Chicken Garden Pasta Bowls made with fresh asparagus and cherry tomatoes tossed in a garlic sauce with grilled chicken, all served over pasta. Combine all the above ingredients in a gallon Zip-Lock bag. Place bag in refrigerator overnight or at least 30 minutes for quick marinade. When ready to cook your meal, remove chicken and place on prepared grill (can also bake at 425 degrees for 30 minutes). Grill chicken over gas or charcoal until nicely browned and done. Cook times will vary depending on grill temperature and chicken thickness. Chop cooked chicken into bite size pieces and set aside. In a large skillet melt the butter with the oil over medium heat. Add the fresh garlic and sautee for a minute. Next add the corn starch and blend with a wire whisk for a minute. Slowly add the chicken broth and the half and half and continue to whisk over medium heat until mixture starts to thicken. Add the grilled cut up chicken to the sauce along with the parmesan cheese and basil. Stir over medium heat until cheese is melted, then add the tomatoes and asparagus spears. Cook another minute or two. Add salt and pepper to taste. Then serve the garden sauce in pasta bowls over hot prepared noodles of your choice. Garnish each bowl with the fresh grated Romano cheese and some lemon zest if desired. Wow does this look terrific. This will become a new favorite with my family for sure!